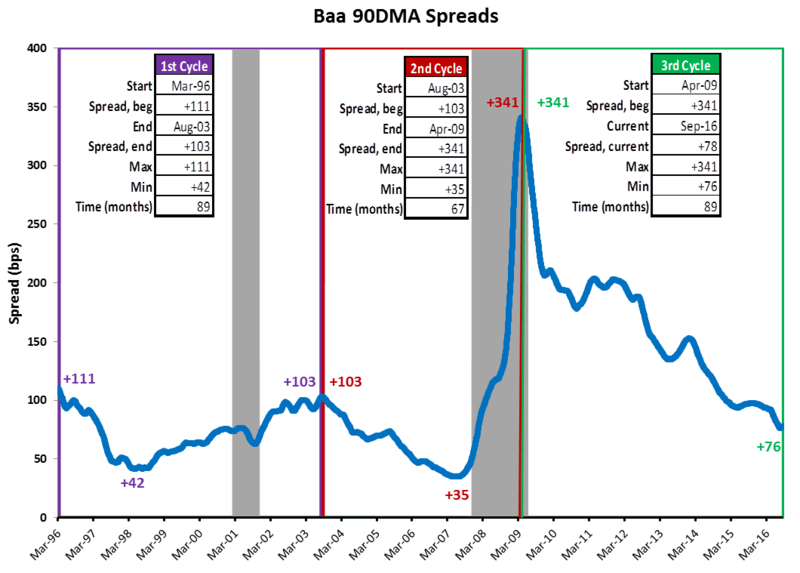 The market appears to be in the late stages of the municipal credit cycle as credit spreads have narrowed to nearly 90% of the full anticipated move. Going forward, a period of "spread stability" is the most likely near-term outlook given solid market fundamentals, with spreads trading in a range around current levels. Given the diversity of municipal credits, the catalyst for spread widening is more likely to come from an external shock rather than from within the municipal market. Evolving from a credit overweight to a more neutral posture is a prudent risk management step given the current risk/reward trade-off. Note: Shaded areas represent economic recession periods. Sources: Municipal Market Data, National Bureau of Economic Research, Baird Advisors. In spite of a few large, well-publicized municipal bankruptcies in recent years, the municipal market remains a very high-quality credit market. In a study of municipal defaults from 1970 to 2015, Moody's found that the rolling 10-year cumulative average default rate for BBB-rated bonds was just 0.4%. The same Moody's analysis for BB-rated corporates revealed a 5.9% default rate, nearly 15 times higher. Yet like any credit market, the municipal market experiences credit cycles. From an issuer's perspective, there are times when borrowing is easy and money readily available; at other times, borrowing can be much more difficult. For investors, there are times when the potential reward for accepting greater credit risk is advantageous and other times, less so. The last few years have been a favorable period, both for municipalities needing to borrow and investors looking to lend. By definition, however, credit cycles are dynamic and investors need to continually review the risk/reward trade-off regarding their municipal credit exposure. One way to track the municipal market through a credit cycle is through an analysis of credit spreads. A credit spread is the additional yield an investor receives as compensation for accepting credit risk. In the taxable market, it is typically measured as the yield spread of a bond over a comparable maturity U.S. Treasury issue. In the municipal market, credit spreads are tracked relative to an AAA-rated national tax-exempt yield curve. The importance of following credit spreads is to help determine how lower-quality credits are performing relative to higher-quality debt. For example, when credit spreads narrow, or tighten, lower-quality issues outperform higher-quality issues and a municipal portfolio benefits from an overweight allocation to credit. When credit spreads widen, lower-quality issues underperform higher-quality debt, and an overweight to credit leads to underperformance. Strategic management of the overall credit allocation through a cycle can help to smooth portfolio volatility and enhance performance. By our measure, we are currently in the third municipal credit cycle in the last twenty years. The current cycle is now in its 89th month, matching the length of the first cycle and nearly two years longer than the second. BBB-rated credit spreads have already compressed to AAA-rated debt by 265 bps (from +341 bps to +76 bps), which is nearly 90% of the way to the narrowest spread (+35 bps) in either of the two previous cycles. Our base case outlook for the near term is a period of spread stability, with credit spreads moving in a range around current levels. Economic and financial market conditions suggest current municipal spreads are appropriate, but given the significant tightening of spreads that has already occurred, further tightening is likely to be more gradual and of less magnitude. With expectations of range-bound credit spreads, rather than a continued tightening trend, evolving a credit overweight in a municipal portfolio to a more neutral posture is now warranted. It's difficult in the near term, however, to identify a muni-specific reason for a reversal in credit spreads. The market seems increasingly able to understand and appreciate the diversity of credits within the municipal market. Detroit and Puerto Rico defaults can co-exist with much stronger credits without the risk of a broad market contagion. If history is a guide, the more likely catalyst for a reversal in municipal credit spreads will be an exogenous event or U.S. recession rather than one emerging from the municipal market itself. This, of course, makes forecasting the cause and/or timing of spread widening very difficult. We define a full municipal credit cycle as the time traveled from one peak in credit spreads to the next. While we track credit spreads across both investment-grade and below-investment-grade municipal debt, for purposes of this analysis we focused on the yield differential between 10-year, BBB-rated municipal debt relative to AAA-rated debt starting in December 1993 to the present. Since 1996, there have two full credit cycles and we are currently in the third cycle in the last twenty years. The first cycle covered the period from March 1996 to August 2003, a total of 89 months. The next lasted just 67 months, from August 2003 to April 2009 and the current cycle is in its 89th month, from April 2009 to the present (September 2016). A brief description of some of the market-moving events in each municipal credit cycle follows, along with the overall change in credit spreads and key market influences. The starting point of this cycle needs to be placed in the context of events that preceded it. In 1994 the FOMC embarked on an aggressive monetary tightening campaign in order to contain rising inflation concerns. The Fed funds rate was raised a total of 300 bps between February 1994 and March 1995. Market yields spiked and levered investors were hit particularly hard. Orange County, California, an AAA-rated county at the time, filed for bankruptcy protection in December 1994 after it was discovered that interest rate derivatives held in a county investment pool had fallen sharply in value causing a $2B deficit. Economic growth slowed early in 1995 and yields on higher-quality bonds fell more rapidly, at least initially, than did lower-quality issues causing credit spreads to widen. The yield spread between BBB-and AAA-rated municipal ultimately peaked in March 1996 at +111 bps to establish the starting point for this new credit cycle. For the next two years, spreads gradually narrowed as macro concerns faded and the market correctly realized that Orange County's financial troubles were an isolated municipal event. Municipal spreads bottomed in May 1998 at +42 bps, having narrowed 69 bps from the start of the cycle. Outside events eventually caused a reversal in spreads, although it took a while for the impact to reach municipals. The Asian currency crisis began in mid-1997 and moved across global markets. The price of oil fell below $11 per barrel, Russia devalued the ruble and defaulted on its sovereign debt, and Long Term Capital Management (LTCM), a highly leveraged U.S. hedge fund, was forced to unwind after a Fed-orchestrated bailout of the entity occurred in September 1998. Unrelated but within the same time frame, the Allegheny Health, Education, and Research Foundation (AHERF), in Pennsylvania and New Jersey, filed for bankruptcy protection in July 1998 with $1.4B in debt, making it the nation's largest nonprofit healthcare bankruptcy. This event helped widen municipal healthcare spreads, but more significant outside influences would soon have a greater impact on the broader market. The dot-com bubble burst in early 2000, leading to a nearly 80% decline in the NASDAQ by the fall of 2002. A mild recession, which began in March 2001, and the terrorist attacks on September 11th of that same year heightened risk awareness everywhere. Municipal credit spreads eventually peaked in August 2003 at +103 bps, nearly back to the level at which they started the cycle. Although this cycle was 22 months shorter than the prior cycle, it was much more volatile with nearly three times the total spread change. The first four years looked very much like a continuation of the prior cycle trend. Spreads methodically narrowed from +103 all the way down to a new trough of +35 bps in July 2007: 68 bps of spread compression. Very few investors foresaw the unprecedented global financial turmoil and deep recession that was about to unfold, and space does not allow a full recap of the historic events that defined the financial crisis of 2008-9. Perhaps the two most noteworthy developments for the municipal market were the unprecedented 35% decline in home prices nationally, pressuring local municipalities dependent upon property tax revenues, and the collapse of the monoline insurers. While other tax revenues fell sharply as well, the decline in property taxes was the most surprising given the long-term stability of this revenue source for municipalities. The demise of the monoline insurers, all of which lost their esteemed AAA ratings, changed the dynamics of municipal trading and credit analysis. In the 2005-6 timeframe, nearly 60% of all new issues came to market wrapped with an insurance guarantee. Post-crisis, the same percentage fell to less than 5%. Another lesson this cycle reinforced for investors was the significant difference in reaction time between the private and public sectors. While the private sector was able to make swift cuts in labor and capital expenses, the public sector could do so only gradually. In fact, demand for government services rose due to the depths of the cuts in the private sector. Municipal credit spreads had already begun to widen by the summer of 2008 as home prices fell and growth slowed, but the catalyst for the dramatic widening of municipal spreads was the collapse of Lehman Brothers in September. In October 2008, the U.S. government announced a series of programs to provide capital to financial institutions. The Treasury Department also temporarily guaranteed money market mutual funds, and the FDIC guaranteed senior bank debt. These and other extraordinary measures helped bring an end to the financial crisis, but not before municipal credit spreads continued a steady climb, peaking at +341 in April 2009. It's noteworthy that it was not events specific to the municipal market that triggered the spread widening during this cycle. Rather, it was the global macro environment and outside forces that cause the extreme volatility. The current municipal credit cycle, which began in April 2009, has been one of the persistent narrowing of credit spreads and a relatively gradual but steady reversal of the extreme spread widening from the financial crisis. The improving fiscal condition of most municipalities has helped support the credit spread compression. Home prices stabilized and have since risen nationally, once again approaching the highs of 2006, indicating property tax revenues have also rebounded. The economic recovery has been slow relative to other post-World War II era expansions, but income tax and sales tax revenue have risen steadily as well, allowing municipalities to close budget deficits and rebuild reserves. Extraordinary monetary policy measures in the U.S. and abroad have helped restore investor confidence and reward risk-seeking investors in the municipal market. Without openly stating so, the Fed clearly sought spread compression in credit markets, and municipal spreads have responded favorably. As of September 30, 2016, municipal credit spreads had narrowed from +341 bps at the starting point to the narrowest levels so far in this cycle of +76 bps, a decline of 265 bps. Most impressive, perhaps, is that the spread compression has occurred in spite of a select group of large municipal bankruptcy filings and persistent news of the unfunded pension and other post-retirement liabilities that many municipalities face. In 2011, Jefferson County, Alabama, filed Chapter 9 bankruptcy, followed by both Stockton and San Bernardino, California, in 2012. The following year, the City of Detroit filed the largest municipal bankruptcy in history, with $18 billion in liabilities. Puerto Rico, with over $70 billion of debt outstanding, recently defaulted on several of its issues and is now under the direction of a federally mandated fiscal control board. Yet through all of this, municipal credit spreads have continued to grind tighter, a testament to the market's ability to understand and appreciate the diversity of credits across the market. Historical evidence suggests that default risk is a low probability for investment-grade municipal credits. For those investors who are willing to do the fundamental and ongoing credit work, investing across the full investment-grade ratings spectrum can be rewarding over a market cycle. Yet, a static allocation to credit may not always be appropriate. Early in a credit cycle when spreads are relatively wide, a meaningful overweight may be justified. At later stages, when credit spreads are compressed and event risk, either from within but more likely outside the municipal market is rising, a more cautious allocation may be appropriate. The present environment leans more toward the latter than the former scenario. To be clear, the most likely near-term outlook is for a period of spread stability, where credit spreads trade in a range near current levels. However, investors should consider evolving to a more neutral credit allocation especially if they have benefited from the narrowing of spreads. Astute managers may find other ways to maintain portfolio yield away from credit. One possible example could be an increase in the level of "structural rise" as credit risk is reduced, looking for ways to achieve additional yield through in-depth analysis of individual security structure and cash flows. There are always market opportunities to consider, and credit exposure is just one of many. The cornerstone of consistent, long-term performance is risk management, which includes the prudent management of municipal credit risk through a full market cycle. All fixed income investments carry a variety of risks such as interest rate risk, credit risk, inflation risk, liquidity risk and loss of principal. In a rising interest rate environment, the value of fixed-income securities generally declines and conversely, in a falling interest rate environment, the value of fixed income securities generally increases. Ratings are measured on a scale that ranges from AAA (highest) to D (lowest). Investment-grade investments are those rated from highest down to BBB-.